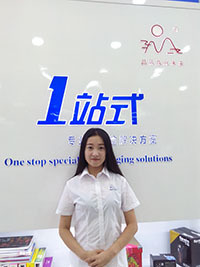 Lucy , a sales in Risunprint, works in the foreign trade department for years. She is familiar with foreign trading process and printing craftwork. Not only communicating with foreigners, but also providing suggestions about the craftwork of packaging boxes and bags are her strengths. Her professional and efficient response will make communication more smooth. Any questions and sample requires, please do not hesitated to let her know.